Right from deleting or hiding your purchased books from iClouds, freeing up storage in your iPhone to permanently delete data from your iPhone, this article is full of handy information which every iPhone and Mac users can use. So, let us begin. 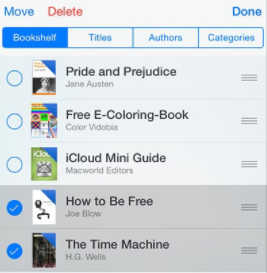 Part 1: How to Delete or Hide Purchased Books from iCloud? Part 2: How to Delete Books from iCloud on Mac? Part 3: How to Free up iPhone Storage? Let us first have a look at how you can hide or delete the books that you have purchased from iCloud iBook. Step 1: Launch the iBook app on your iPhone. Step 2: At the bottom of the screen you will see the “My Books” button, tap it. Step 3: On this My Books screen, look at the top right hand corner of the screen for the “Select” button and tap it. Step 4: Now, simply select the books that you want to delete. Step 5: When you will tap on the Delete button, you will be provided with two different options- Delete and Delete this Copy. If you tap on Delete, the book will be hided and no longer be available in the iBooks app. However, you can go to the Purchased option to again download the book. If you select Delete this Copy, the book will be deleted from the device but will still remain in the iCloud and will have the iCloud icon after deleting. Another way to permanently delete the book from your device is by using a Mac PC. Follow the below mentioned steps. 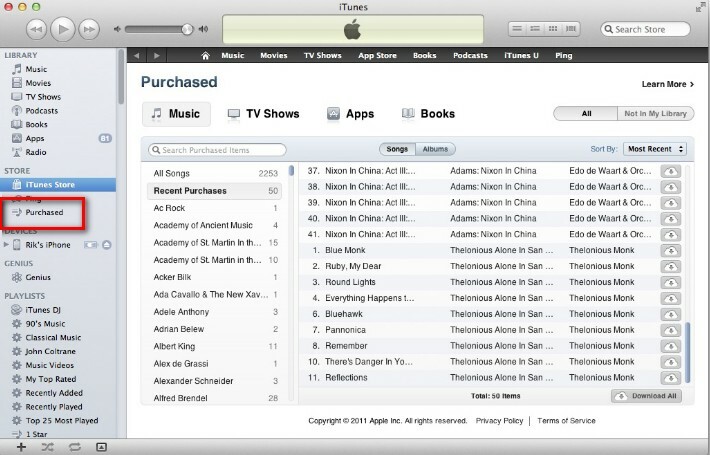 Step 1: Open the iTunes app from your Mac PC. Log in to your account by entering your ID and password. Step 2: After logging in successfully, look to the right hand side of the screen and you will find the “Purchased” option, click on it. Step 3: Now, at the right side of the screen you will find “Books” button. After clicking, you will have the list of all the books that you have purchased from iBook. Hover the mouse on the book titles and you will see “X” mark for deleting the book. Step 4: Simply click on this “X” mark and the book will be deleted from all your devices. 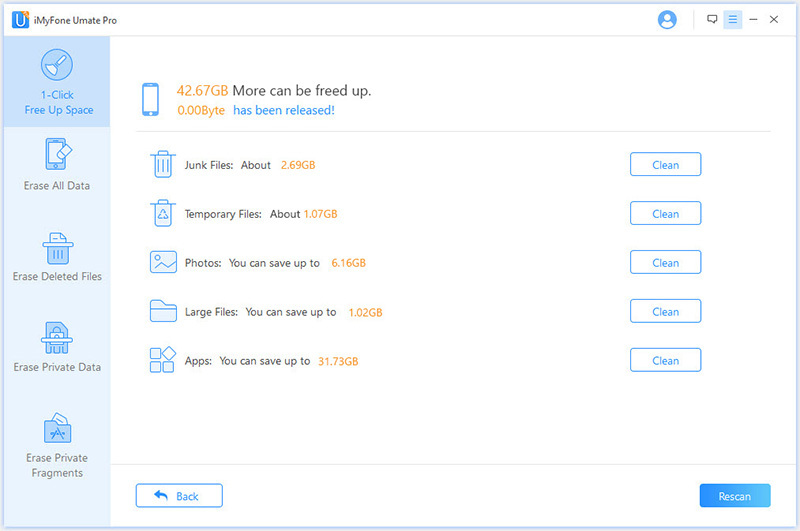 If you delete books from iCloud, just want to geting more free storage, you can also try iMyFone Umate Pro or iMyFone Umate Pro for Mac to free up iPhone space. 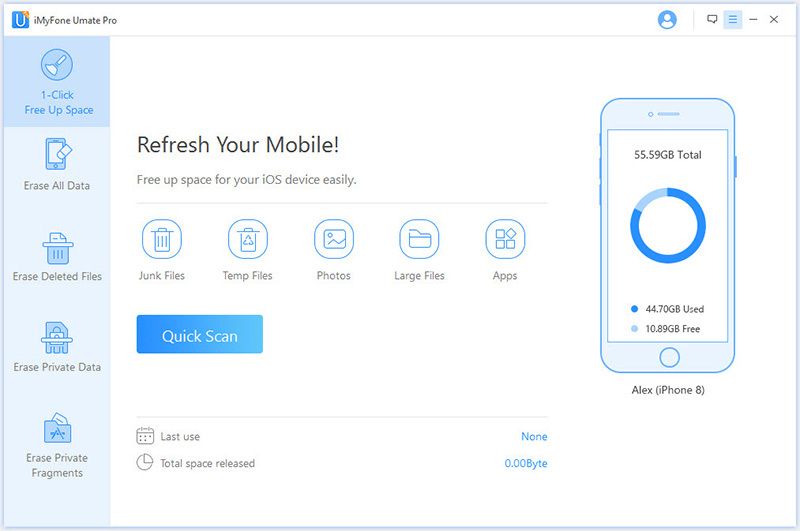 With the help of this software you can free up storage of your iPhone within minutes and minimum efforts. To free up space in your iPhone with the help of iMyFone Umate Pro, follow the below mentioned steps. Step 1: After installing the software in your PC or laptop, launch it and then connect your iPhone to your PC/laptop. Step 2: Now, simply click on the "1-Click Free Up Space" and "Quick Scan" button, the software will start its scanning process. Step 3: Once the scanning process is over, you will get detailed analysis of all the data which can be deleted from your iPhone. Right from Junk Files, Temporary Files, Photos, Large Files, to Apps. Step 4: Simply click on the Clean button of these categories and it will be cleaned to free up substantial amount of space in your iPhone. If you delete data from iPhone using normal way, the data is still recoverable. Thus, it is essential to permanently delete iPhone private data. Apart from 1-Click Free Up Space feature, the software also allows you to permanently erase all kinds of iOS data from iPhone, iPad, iPod Touch using erasing modes and make sure that it cannot be restored by anyone with any data recovery software.